Review: Benjamin Esposito is a retired legal counsellor. He decides to write a novel in the hope that he can find closure on one of his past homicide cases and also his unreciprocated love for his superior. Both of these have happened but it still haunts him decades later. 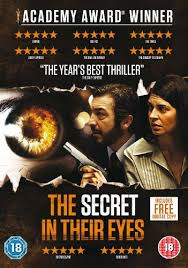 This is an Argentinian film so therefore the original title for this is El Secreto de Sus Ojos. Based on a novel by Eduardo Sacheri. All of the performances are excellent. A very watchable and well-made film. This can be harrowing at times. The main theme in this is the important role of memory in our lives. At the Academy Awards in 2010 this won 1 Oscar and that was for Best Foreign Language Film of the Year.